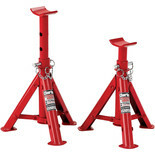 A pair of broad base professional duty axle stands with positive ratchet action for quick height adjustment and secure locking under downforce load. 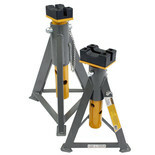 2 Tonne folding Axle Stands - Welded steel construction for increased strength and safety. 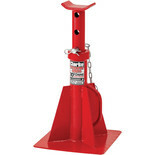 3 Tonne Axle Stands - Welded steel construction for increased strength and safety. 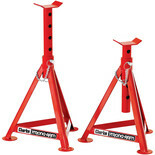 These Draper Axle Stands provide expert quality and are a must have for any workshop or garage. Making light work of supporting any vehicle. 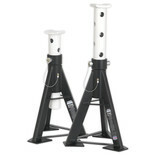 These 6 Tonne Axle Stands have been constructed from a welded steel construction for increased strength and safety. 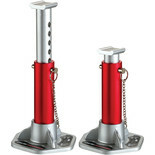 These axle stands are finished in a tough anodised coating, these sturdy aluminium axle stands are perfect for the home mechanic. 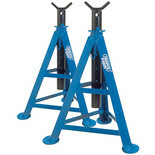 These axle stands have a large support saddle with rubber protection to avoid damage to lifting point. For vehicle enthusiasts and professional mechanics, Machine Mart offer a range of axle stands, car ramps, and transmission jacks. 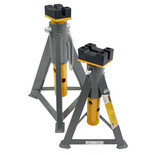 Our range includes heavy duty 6 ton models as well as smaller 3 ton stands, all with adjustable heights. 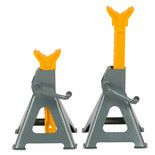 Smaller axle stands are available as part of our 4 or 10 piece garage kits which also include hydraulic jacks and car creepers. 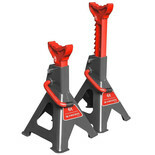 As well as axle stands, car ramps and other automotive tools, Machine Mart carry a complete range of tools and equipment suitable for DIY enthusiasts through to professional traders. 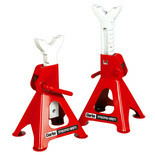 We supply tools from all the leading brands including Bosch, Dewalt, Ryobi and Clarke. You can buy online now, order by phone, or visit any of our superstores across the country. 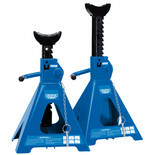 We have a massive range of tools at competitive prices.